For the third installment of this month’s series of movie recommendations based on remakes, I wanted to do a Western. The obvious choice would be John Sturges’ Magnificent Seven, which is magnificent and often considered one of the top remake films of all time (source material: Seven Samurai). But I couldn’t pass up the opportunity to spotlight Sergio Leone’s 1964 take on a different Kurosawa movie (Yojimbo) in A Fistful of Dollars (Per un Pugno di DollariÂ ). The plot centers on Clint Eastwood’s most iconic creation, the Man With No Name (I’ll call him Poncho to make life easier). Poncho is one mean dude with a cunning mind and a lightning trigger finger. When Poncho arrives in the small town of San Miguel, he sees a young boy being abused while traversing the main street. Poncho makes his way over to the inn, where the kindly innkeeper Silvanito tells the story of how the town has been mistreated much like the boy: while trying to get on with one’s day, residents of San Miguel are regularly harassed either by the town sheriff John Baxter (played by Wolfgang Lukschy) or by the three Rojo brothers (of whom RamÃ³n, played by Gian Maria VolontÃ©, is the leader). Poncho hatches a dastardly plan and soon secures for himself a position as a hired gun for both families. He plays the two against one another, kills some scumbags, re-groups, kills some more scumbags, gets beaten up a little, kills a whole bunch of scumbags, and collects a whole pile of cash. And then he kills some scumbags. Poncho has frustratingly little to tell us about himself, much like the other characters in the story. This isn’t a film for those looking for profound character development. Only fleetingly does Poncho reveal his own motives for taking on the crime families in San Miguel, or for assisting Silvanito and his daughter. Even then, don’t expect to learn much of his – or indeed anyone’s – backstory. All the characters are pretty thin, really, but there’s plenty to keep you entertained all the same just by virtue of the two character traits you can get some purchase on: almost everyone is unremittingly opportunistic and violent toward one another. When Poncho rolls into town, the first moment in which he seems to pry his detachment loose is when he realizes there’s a chance to make a buck by profiting on death and misery. Comparing Fistful to Magnificent Seven clarifies one of Leone’s main contributions to Westerns. 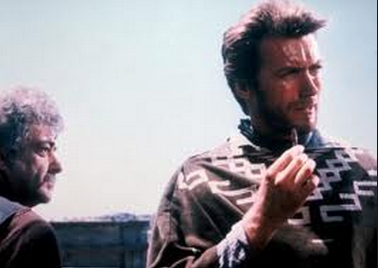 Before the Spaghetti Westerns, the good guy was always easily distinguishable from the bad guy. What difficulties the good guy had to endure were typically the challenge of forsaking one virtue for another (think Will Kane’s deliberation between being a family man as opposed to being a lawman in High Noon, for example). Not so in Leone’s world. Here, even the protagonist is just rotten to the core. As one of Leone’s first credited efforts as director, Fistful has some rough edges. There are some woefully bad dubbing edits, and the film is replete with the hallmark gimmicks of a director still learning his craft. Some of those gimmicks would later become Spaghetti Western benchmarks, like the eyes that appear slowly from underneath the brim of a hat as the character raises his head, or characters entering the scene through the dusty cloud of smoke and sand. While it isn’t always perfectly executed, and it can sometimes feel as though Leone’s trying just a little too hard to create a sense of drama, I usually give him a pass. After all, he is the reason those gimmicks became staples of the genre in the first place. I’ve already written about my love of Leone’s Spaghetti Westerns. While I maintain that Once Upon a Time in the West is still my favorite Western, each of the installments in the Dollars trilogy is fun in its own – very different – right. Here’s a fun bit of movie trivia: Leone fully intended to kill off Poncho (as well as Eli Wallach and Lee van Cleef, who would complete the Good, Bad, and Ugly set in the later instalments of the Dollars trilogy) in the opening scene at the train station in Once Upon a Time in the West. This was supposed to be the grand introduction of his next Man With No Name, with Charles Bronson as Harmonica, but scheduling conflicts meant that Leone’s vision never materialized. For the best, really; I might have wet myself if he’d pulled it off.